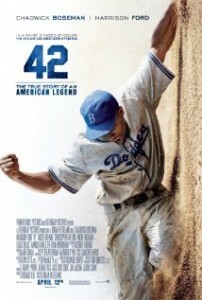 Expect to see more than a bit of synergy tomorrow as the top movie in the nation ties in with what was once the top game in the nation, as they both pay tribute to Jackie Robinson. The Robinson biopic “42” topped the weekend box office bringing in $27.3 mil, making it the highest debut ever for a baseball film. The previous being “The Benchwarmers” which opened to $19.7 mil. in 2006. Critics gave the film high marks and the audience crossed all demographics. On Monday, Major League Baseball will commemorate their annual Jackie Robinson Day where all players and umpires will wear Robinson’s number 42. “Scary Movie 5” wasn’t as scary as its predecessor at the box office, but made studio execs happy enough. The horror spoof pulled in $15.2 million. In contrast, 2006’s “Scary Movie 4” raked in $40.2 million in it’s debut. Starring “Phineas and Ferb’s” Ashley Tisdale, Lindsay Lohan, and Charlie Sheen, will easily make it’s money back having cost The Weinstein/Dimension group a mere $20 million to make. The animated caveman movie “The Croods” came in at third for $13.2 million. So far, “The Croods has pulled in $142.5 in the U.S and $207 million overseas. Apparently there’s big money in evolution. Last week’s winner, “Evil Dead” fell to number 5 earning $9.5 million at the box office. So far, the horror remake has grossed $41.5 million. “G.I. Joe: Retaliation” fought off bad guys to the tune of $10.8 million this weekend, bringing it’s total to $102.4 million.